The industrial food chain is specialized, mono-cultural and linear in contrast to the complexity, diversity and interdependence of the peasant food web. Monsanto breeds bean with processing in mind, not home gardeners. 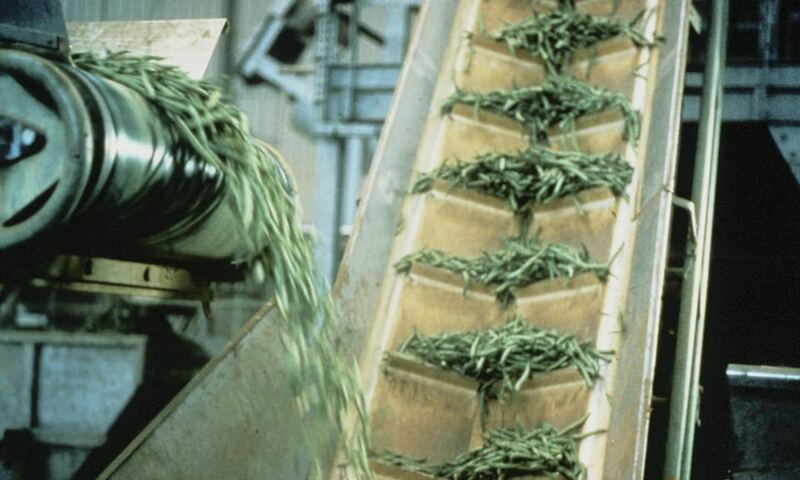 Green beans need to be very tough to handle mechanical harvesting, processing, canning or freezing. While the food chain is linear, it is long, with many processes and much transport between the seed and the plate. Industrial farmers don’t know the source country of the seed they buy, the supermarket attendant may never have seen a farmer, the consumer is not told anything about plant origins, processing and preservatives. In some countries like USA Genetically Modified Organisms (GMOs) are not even labelled. The poor of the rich world annually eat 50kg of chicken yet the majority have seen neither a live nor a dead fowl, just chicken nuggets. Restricted Diversity: Peasants have domesticated at least 5,000 plant species but the industrial food chain uses only 3% of them*. Only about 150 plant species are grown commercially around the world. Globally crop production concentrates on twelve plant species of food plants (with maize, rice, wheat and potato dominating). Each link in the food chain right up to your plate, is dominated by a handful of corporations working across borders. Fungicides, seeds, and Roundup herbicide in an Indian seed and chemical shop in Mysore – that about sums up the industrial food chain. The chain begins with the multi-million dollar research lab, the breeding of seeds in glass houses to produce hybrid and GMO varieties dependent on agrochemical pesticides, (Monsanto along with Dupont dominates seed and pesticides). Patenting offices, such as UPOV in Switzerland, protect the investment. The processing of food drastically reduces its nutritive content and compensates by adding artificial flavors, vitamins and minerals derived from the oil industry. Fewer manufacturers constantly create more new / same products promoted by advertising campaigns. Lastly the well-oiled distribution chain (dominated by Walmart in the US and Woolworths and Coles in Australia) rents its shelf space to the highest bidder. The populace becomes fat and sick on this denatured, nutrient-sparse food. Meanwhile there is environmental destruction and social upheaval on a massive scale with land grabs and rural exodus to urban nightmares and this really bad food. Let’s look at who owns what seed. * E. Small and P.M. Catling, “Global Biodiversity – The Source of New Crops,” Biodiversity 9 (1&2), p. 4. Pat Mooney wrote the following for the Seed Freedom campain in 2012. Please visit etcgroup.org for more information. Extensive irrigated soya bean field been defoliated for easy harvesting of its dry beans. The global commercial seed market in 2009 is estimated at $27,400 million. The top 10 companies account for 73% of the global market (up from 67%in 2007). Monsanto, the world’s largest seed company and fourth largest pesticide company, now controls more than one- quarter (27%) of the commercial seed market. Dow Agrosciences – the world’s fifth largest pesticide company – made a dramatic re-entry on the top 10 seed company list in 2009 following a seed company-buying spree that included Hyland Seeds (Canada), MTI (Austria), Pfister Seeds (USA) and Triumph Seed (USA), among others.The commercial seed sector is inextricably linked to the agrochemical market. Five of the top 6 agrochemical companies also appear on the list of the world’s biggest seed companies, and the one that doesn’t – BASF – has significant partnerships with the biggest players in seeds.BASF’s longterm collaborations involve every major crop and include a project with Bayer CropScience to develop high-yielding hybrid rice varieties and a $2.5 billion R&D deal with Monsanto on stress-tolerance and yield in maize, cotton, canola, soybeans and wheat. 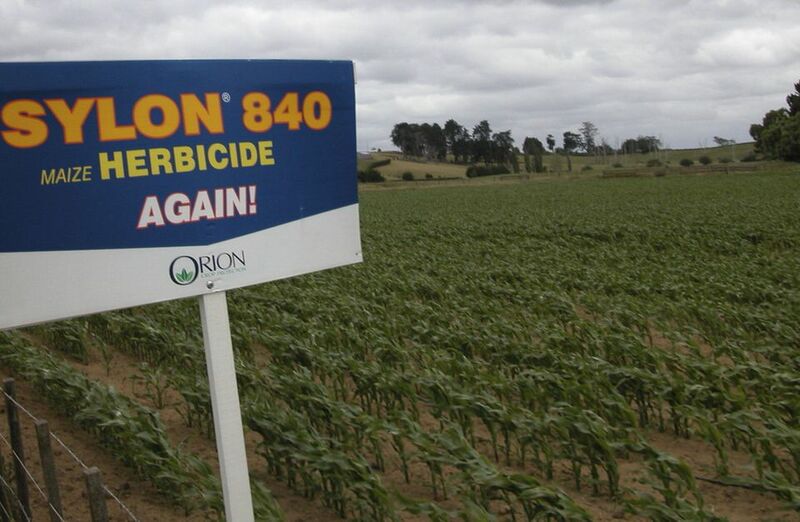 Once again herbicide being used on maize in New Zealand. The seed industry consolidation trend continues, with emerging markets – especially Africa – the most recent target. In 2010, Pioneer (DuPont) announced it intended to make its largest acquisition ever by buying South Africa’s biggest seed company, Pannar Seed. Pioneer’s purchase would have doubled its seed sales in Africa, giving it access to local germplasm as well as a foothold in 18 other countries on the continent where Pannar does business.80 Under pressure from activists – led by the African Centre for Biosafety and Biowatch – South Africa’s Competition Tribunal nixed the deal in December 2010. Pioneer is appealing, contending that the Tribunal’s decision is based on unfounded prejudices against GMOs and multinationals.81 The Tribunal will hear Pioneer’s appeal in September/October 2011. The African Centre for Biosafety has pledged to keep fighting the deal and has launched an investigation into all seed holdings and licensing/cross-licensing deals in South Africa of DuPont’s biggest rival, Monsanto. (Monsanto is South Africa’s second biggest seed player;82 its engineered traits are present in an estimated 75% of all GM maize planted in South Africa. The industrialization of agriculture has caused an erosion of the diversity of crop varieties. Farms specialize in livestock or crops, reducing the number of species; fields are enlarged, reducing the extent of field margins and hedgerows; soil amendments enhance the uniformity of soils; and monocultures of genetically uniform individuals tend to dominate (Frison et al., 2011). Here is someone now who knows his onions it is Dr. Salvatore Ceccarelli who has been a plant breeder with the International Center for Agricultural Research in the Dry Areas (ICARDA) in Syria since 1980. Formerly Full Professor in Agricultural Genetics at the University of Perugia, Italy, today he is an authority on participatory plant breeding with farmers and has won many accolades for his contributions including the CGIAR award for the Outstanding Scientific Article for the year 2000. This article was published in the Seed of Freedom report which we contrituted to along with many in the seed conservation movement. Plant breeding has contributed greatly to the decrease of agricultural biodiversity which can be quantified by the fact that barely more than 150 species are now cultivated; most of mankind now lives of no more than 12 plant species, with the four biggest staple crops (wheat, rice, maize and potato) taking the lion’s share (Esquinas-Alcázar, 2010). 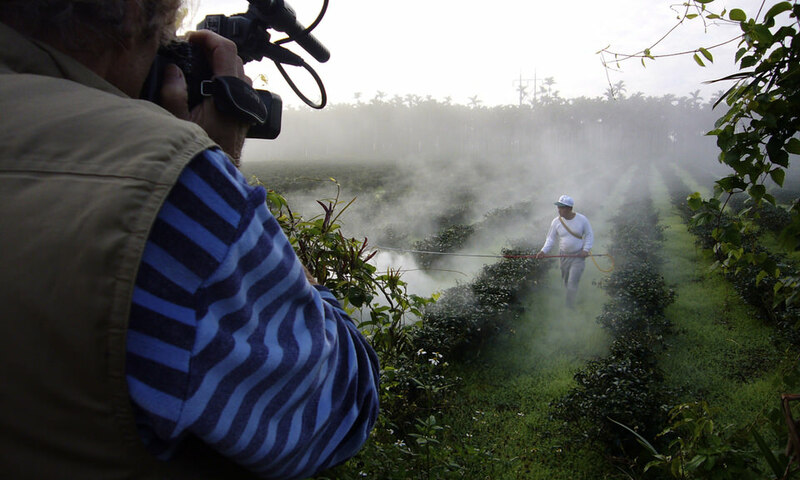 Spraying tea in Taiwan early morning for fungicides. 62% and 74% of the rice varieties in Bangladesh and Indonesia, respectively, descend from a common stock.Furthermore, the differences between collecting missions in Albania (1941 and 1993) and in south Italy (1950 and the late 1980s) showed high losses in genetic variability with levels of genetic erosion of 72.4 and 72.8%, respectively (Hammer et al, 1996). In India, rice varieties have declined from an estimated 400,000 before colonialism to 30,000 in the mid-19th century with several thousand more lost after the green revolution in the 1960s; also Greece is estimated to have lost 95% of its broad genetic stock of traditional wheat varieties after being encouraged to replace local seeds with modern varieties developed by CIMMYT (Lopez, 1994). (Lopez, quoted by Heal et al. (2004) also quotes a boast by Stalin to Churchill: “We have improved beyond measure the quality of our wheat. We used to sow all varieties, but now we only cultivate the Soviet prototype. Any other cultivation than that is prohibited nation-wide.” The evolution of plant breeding helps explain the process of genetic erosion and how the changes in who is controlling seed production and seed supply occurred.